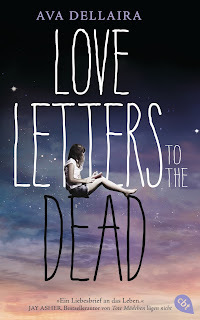 "Love Letters to the Dead" gave me the same wistful feeling of sadness and hope, gravity and flight like "The Perks of Being a Wallflower" did. I have long been looking at the display of the book whenever I pass by a bookstore. There is something in the title that intrigued me to no end. But having little space for books and less time for reading, I decide to skip getting it. Yesterday, while waiting at the airport, I realized I had an ebook version. I finally decided to give it a go. The first phrase was "Dear Kurt Cobain,"
That line already got me hooked. I knew it was going to be interesting. 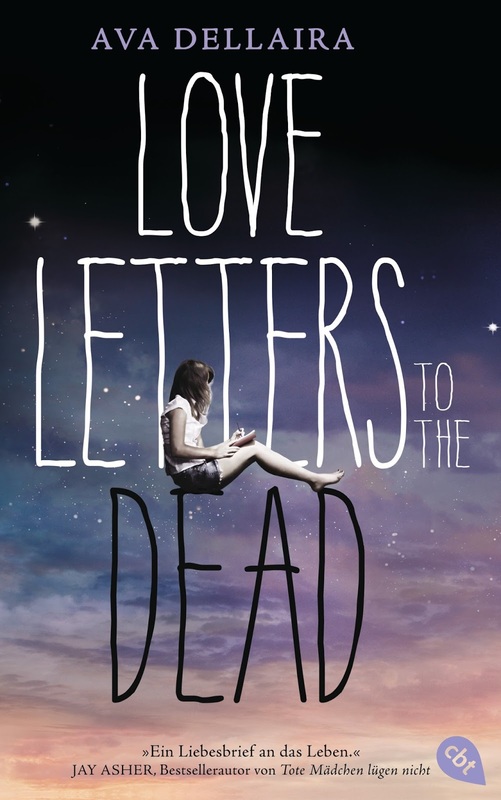 It all started as an English assignment in which the lead character, Laurel, had to write letters to the dead. Laurel ends up writing to different famous dead people like Janis Joplin, Amy Winehouse, Judy Garland, etc. as she deals with her personal tragedy and coming of age. I could feel myself getting drawn into the story, into Laurel's loss and pain and hope and anger. I could feel my stomach churn as she started falling in love with Sky or my heart writhe as she held onto her memories of her dead sister, May. I wished for Kirsten and Tristan's ending to be different and yet know it is what it shall be. I wished for Natalie and Hannah to find their truth. She wrote letters to dead people, mostly musicians. People who seemed brave, yet it ended up they were fragile and vulnerable as we are. Maybe more so. They were famous, yet they were alone and lost. At some point, they were so lost, they decided to totally let go. It was that kind of book that after you closed it, you stare into space and try to gather and fathom as much of the feelings you had from reading it. You may have gone through something similar, you may have not. You are not them, but somehow, once upon a time or maybe right now you felt as they did. You stare into space and you imagine holding the hearts of the characters and wish them well. You are doubtful they will have their happily ever after. You know better. But you hope that there will always be something for them to get them through the day. You look at them walking wounded (borrowing from EBTG), yet you know it is those very wounds and those very scars that made them beautiful. I loved the book so much that I actually took the time to write how I feel about it! I'm torn. Should I go mushy or should I go funny? Since I have only a few minutes to write this, I'll just go with the flow. It has been a very, VERY exciting year. And you know that I do not mean it in a "wow, what a great year it was." It was exciting because there was much stretching of our selves this year. You were stretched as a son, having lost Papa. 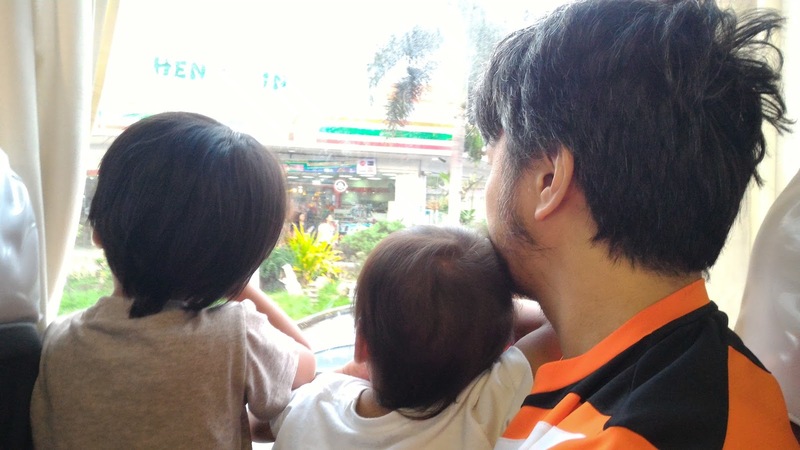 You were stretched as a father, when we finally decided, let's raise our children on our own, without a yaya. You are a wonderful one. All through everything, you remained calm and chill. As opposed to my emotional and stressed. Much as it usually frustrates me, it also impresses me. How do you do it?! That's the Jan magic, I guess. So yeah, you are a walking paradox to me. Your very virtues that annoy the hell out me, I know, are also the very ones that help you put up with my frenetic energy. You are my boon and bane. You are my annoyance and comfort. You stress me and yet if it were somebody else, I'd probably be more stressed. So yeah, happy birthday! I may not show it, but I know I'm lucky. Only a guy of your patience could put up with my neurosis. 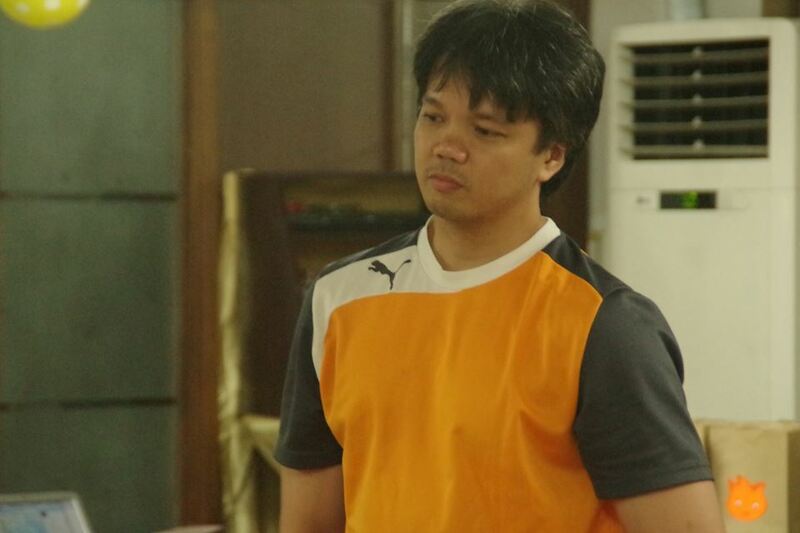 Yan ba ang mukhang kwarenta? Maligayang kaarawan. Marami pa akong gustong sabihin, pero atin-atin na lang yun. Yesterday, while I was dressing up Alon for sleep time, he declared. "Di na ako magdede kasi malaki na ako." I was actually thinking he was trying to impress his new pretty (temp) yaya. Haha! When we got to bed, I reminded him of what he said. He confirmed that he would not be nursing since he was a big boy already. How proud I was! Except he woke up several times in the middle of the night, semi-conscious, asking to nurse. I refused, reminding him of what he said. Today, he declared it again. And yes, we did not nurse to sleep. Hopefully, there will br less waking up tonight so he won't be begging to nurse. That Baby Blues cartoon is true indeed. Bittersweet. I feel so relieved that he is almost ready to wean. To be honest, I'm a bit tired of nursing Alon but it's just less stressful to let him nurse than battle him every night. Besides, it helps with my milk supply for Alab. But in a way, I am wistful of the past two years and almost ten months of nourishing my son. Let's see if this is finally it for Alon. I hope for Alab, I achieve two years too. 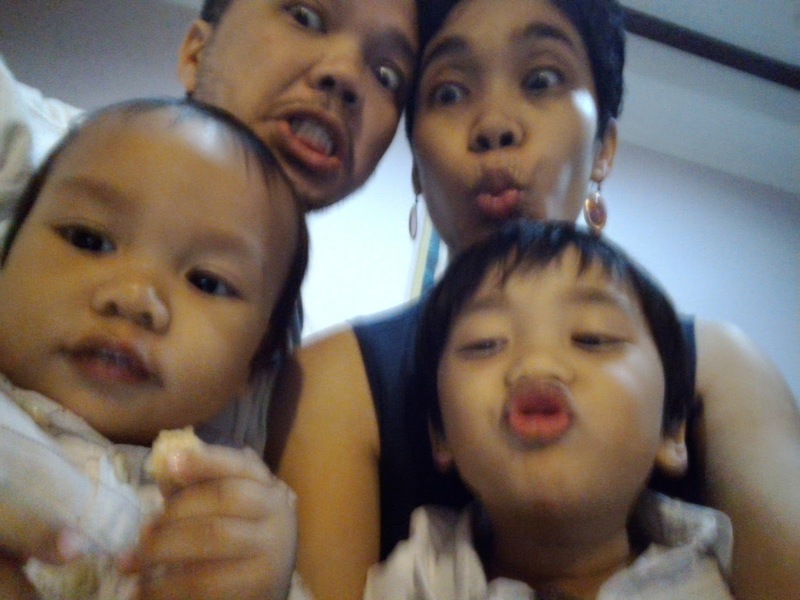 At least, this Sunday, we will be reaching his half-year milestone. I will be a quarter of the way of my goal. Yey! When I was younger, I told myself that I would never allow a boy to hold me down. It was actually the movie "Kramer vs. Kramer" that led me to that resolve. I didn't want to be Meryl Streep leaving her family because she did not know who she is. While I was single I made the most of what I had and to do as much as I could with my NGO salary. 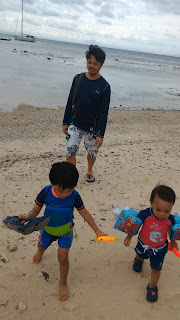 I had lots of fun with good friends who were the perfect travel buddies and gimik partners. Then I met someone the moment I stopped looking. Things changed a bit but I was lucky enough to be with a man who had the courage and security to let me fly, whether with him or on my own. Eventually, I married that man on a Friday the 13th in 2008. A couple of months after I flew to Netherlands to pursue my masters. Nope, that boy did not tie me down and even wished me a wonderful time, which I did have. The fates, however, like to play tricks. Now, they made me eat the words I told myself many moons ago. I can't believe that a couple of boys tied me down! One aged 2.5 years and another 2.5 months. I will not have any surprise encounter right now with a Pope I adore and admire greatly despite the fact that the Nunciature is probably 3-4KM away from where we live. I have been tied down by those two, in particular, the smallest of the bunch. I'm missing out a bit, I know. But the Pope himself has consoled me during the meeting with the families as well as his homily in Tacloban when he made mention of the Mother. That is my role now, one I have embraced fully and sometimes obsessively. FOMO - fear of missing out. I have missed out a lot with Pope Francis in terms of having a personal encounter. But I have several TV networks to provide me consistent updates. And seeing him, even through a small screen, is already enriching and spiritually nourishing. But there is no camera to follow my boys around and I am definitely their number one devotee. I am the one they call "mother." When Alon wakes up, he calls for me first. When Alab wakes up and I greet him, he has this sweetest smile that assures me he is happy to see me. My labor with Alon lasted about six hours in the hospital. Probably additional four while doing my business in the office that morning. I thought that was fast hearing stories from friends. Apparently not compared to Alab! My OB did warn me that labor the second time around would be faster. I did not realize how fast was faster! Alon came out when I was 36weeks 6 days with him. So when I reached the 37th week, I was getting a bit impatient though full term is really 39 weeks. During the wait, I'd have very uncomfortable Braxton-Hicks contractions which could be mistaken for labor so when the actual labor came, I was again assuming it to be a bad case of BH! I have been suspecting early labor since Saturday but did not pay it much heed knowing I will just be sent home if I was less than 3cm dilated. Or they may make me stay which would up the cost of the hospital unnecessarily (cheapskate, remember). Sunday morning, the contractions were getting more frequent. But according to my contraction timer, it was still early labor. I wanted to go to Mass early and Jan said we can walk around Ayala Triangle to induce the labor. We weren't able to do as planned because the brunch Jan was preparing was ready by 2pm. Hehe! By 3pm, I suspect that I was in active labor already but I still did not want to go to the hospital. I had to concede though that Mass and Ayala Triangle were no longer a good idea. 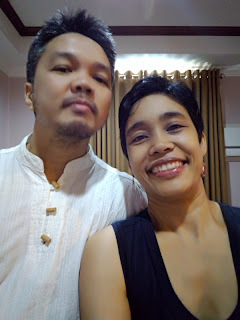 I told Jan there was a Mass at MMC at 7PM so we could go there instead. By 4.30PM, I called my brother so he can stay with Alon while we were at the hospital. I took a bath and Jan got my hospital bag ready. I wanted to wait until he got to our place but by 6PM, I decided to finally go because the pain was getting really, really uncomfortable. We got to the hospital around 6:30PM. Since my pregnancy was unremarkable (always a good term in doctorese. Hehe! ), we were able to avail of the maternity package. This included the anaesthesiologist and related meds. So again, there was the surprised nurses and resident when I opted not to have an epidural. In a sense, it was crazy indeed when it's paid for. I just wanted to be drug-free the entire experience. I have to admit that I was *this* close to asking for it because the pain was none like I experienced with Alon. While it was six hours, it was a gradual increase in pain that was tolerable. This time, it was a sharp increase that I was not ready for. I was gripping the bed rails like mad, the nurse was telling me, "mommy, baka masira po!" As usual, these crazy hospital staff kept asking me the same questions I was asked prior to admission. I wanted to shout at them and tell them to go ask each other because can't they damn well see how much pain I am in. I just answered anyway. And all those effin' forms I had to sign, papers they kept shoving to my face while in the middle of a contraction. Argh. I wanted Jan to be with me since we were doing lamaze but they said they can only let him in in the delivery room. We were still in the labor room. I asked of we can have the birthing room instead which we would just pay on top of the package. Crazy hospital said that was not allowed since I was having the package. In the middle of my pain, I was arguing with them about their insane logic. After all, I was willing to pay extra. This time, I was glad they did not heed the customer because it was unnecessary. I was also asking if I can go to the toilet because I felt like I was going to poop. They told me I can just use the bed pan instead. (No, it was not poop but Alab getting ready). I was yelling so hard with the pain, I pity the other moms hearing me. Jan could hear me from outside. My OB was not yet there, so the resident was handling me. And of all the things to tell me, "mommy, don't push yet." WTF! No way am I not going to push! I wanted the pain over and done with! And besides, it's not like I can help it. So we were still at the labor room when I heard "crowning!" They had to rush me to the delivery room. I was asking for Jan already. He still wasn't there. Still no sign of my OB. It was probably between five to ten minutes since they transferred me to delivery that Alab came out. He arrived before my OB and before Jan.
My doctor arrived in time for clean up and episiotomy. And she gets full fees pa din as agreed. Swerte niya. Hehe! We were transferred to the recovery room. I was so hungry I asked Jan for a Burger King meal. My first time away from Alab was spent watching Mockingjay, which I really enjoyed. Though I was half wondering if that was a good idea since it was quite a heavy movie. Which was to be expected since I read the book anyway. 1. Kung mamalasin ka nga naman! I ended up seated beside THAT moviegoer who gives a running commentary of something you are actually seeing yourself. "Uy, daming flowers." Who barely has an idea what's going on, "madami pala flowers dun..." Who has to give an opinion which shows he barely understands the complexity of things, "parang baliw!" Referring to Pollux. Wanted to smack him but had to restrain myself. 2. Finnick Odair is so damn hot, it's ridiculous. What kind of jaw is that?! 3. Effie Trinket can rock that jumpsuit in so many ways! 5. Revolution scenes always make me cry. The courage of the nameless people who choose to fight in the name of freedom. I think of Syria, Iraq, Rwanda... I feel blessed that I can speak up without fear of being shot. 7. "Hanging Tree" scene... Wow. So powerful. 9. Margery Tyrell is even hottermas Cressida. Wish I canwear my hair like that! 10. Can't wait for Part 2.